How about Harvest – a stunning feature film set in the mountainous Cathar country? Wow! Just like Hollywood. I get to back a film. And for my £15 I’ve ‘joined the journey.’ They’ll keep me posted with regular updates and I’ll receive a ‘unique digital still’ from the shoot. Then again, I could back The Really Magic Carpet – a children’s book on grief and hope. I need to spend slightly more – £33 – but for that I’ll get a copy of the book with a ‘letterpress illustrated nameplate’ inside it. If you haven’t already guessed, I’m on Kickstarter: specifically, the London, UK page of Kickstarter (and my apologies if any of the links don’t now work: I set them all up on Tuesday). Crowdfunding is new – and right now it’s still small. It’s estimated that in 2014 the Crowdfunding industry raised $16.2bn – a significant amount of money, but a tiny fraction of the amount banks would have lent to businesses. But it’s expanding rapidly – and it is undoubtedly enabling projects and businesses that a traditional lender wouldn’t even consider to start, thrive and, quite possibly, start employing people. Ten years from now crowdfunding may well be the main source of start-up capital for small and medium sized companies – especially in the creative sector. There will undoubtedly be a billion dollar corporation that wouldn’t have existed without crowdfunding. So if I ‘invest’ through Kickstarter I’m offered a ‘reward’ – for example, my book and the illustrated name plate. But supposing I want more than that? Supposing I want to invest rather more than my £33 and I’d like to take an equity stake in the business? There are an increasing number of crowdfunding sites offering exactly that: take a look at Syndicate Room for example, and you’ll see what I mean. Equally, I can choose to lend money to a start-up or growing business – and potentially receive a far higher rate of interest than I would on the high street. Perhaps the best known example of this peer-to-peer lending is Funding Circle. Back with Kickstarter – and the three examples I chose. ‘Attack the Pack’ was looking to raise £7,500. And it’s achieved its goal – with four days of the funding period to go, 315 backers have pledged a total of £9,201 (so just under £30 each). Harvest is 60% of the way to a £15,000 goal, whilst I’m delighted to see that 211 backers have sent ‘Magic Carpet’ comfortably past its £10,000 goal. …And I chose businesses that were looking for roughly similar amounts, so that my £30 would buy me something. Go back to the London page and you’ll see the Bluetooth Wearable Gesture Controller (amount raised, nearly $150,000): doppel – performance enhancing wearable technology – has raised nearly £90,000. And if you want to be really impressed, earlier this year Pebble Time became the most successful Kickstarter project ever when it raised more than $20 million. 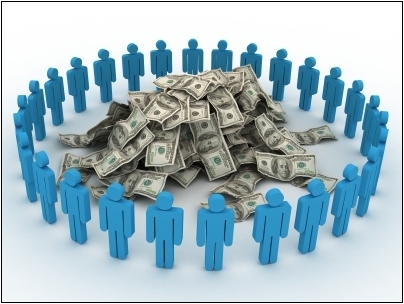 That’s a very basic introduction to Crowdfunding in general and Kickstarter in particular. There’s no doubt they’re both going to play an increasingly important part in business life. Make sure you’re aware of the possibilities they offer, both for your own business – and for projects that might be close to your heart. Team Building? Or Team Busting?